Kobe Bryant has been retired for over a year, leaving behind a legacy as a Los Angeles Laker like no other. Mark Medina of the Southern California News Group caught up with Kobe recently to discuss why he isn’t missing the game as much as he thought he would, his burgeoning career in film, and how he plans to pass on his teachings to the Lakers young core. Audio is included from Lakers head coach Luke Walton, rookie forward Brandon Ingram, general manager Rob Pelinka, and of course, Bryant himself as you might not have heard him before. After Russell takes a sip of Gatorade’s new drink, the commercial shows the Lakers’ second-year guard using his playmaking and quickness to attack the basket. Because of those skills, Russell averaged 15.6 points, 4.8 assists, 3.5 rebounds and 1.4 steals per game, numbers that only Magic Johnson matched as a Laker in his sophomore season. Because of those skills, Russell is also landing endorsement deals. 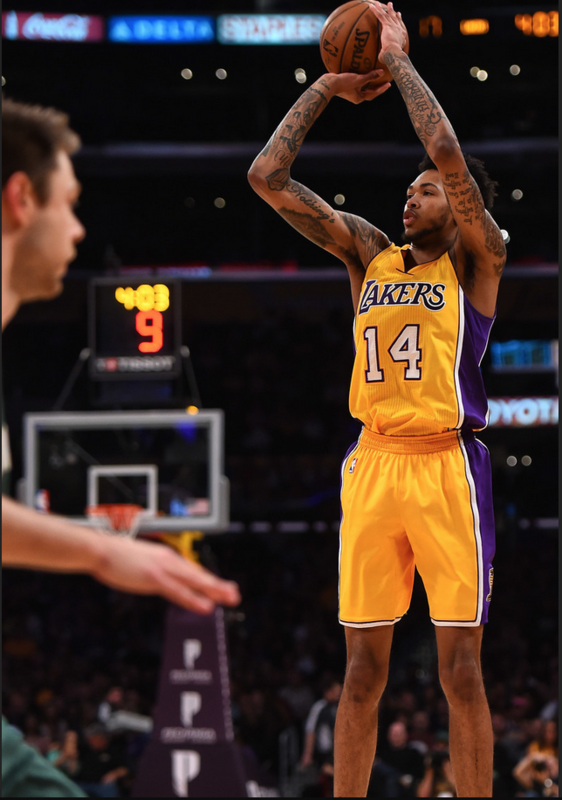 The bucket list seems endless, as Lakers forward Brandon Ingram strives to improve this offseason by bulking up in muscle, playing in Summer League and working out with Kobe Bryant. Ingram also added another item on that to-do list. He partnered with DonJoy Performance, which calls itself the “leading creator of innovative sports bracing technology” through products that help with injury prevention, protection, pain and performance. The man cemented his legacy with five NBA championships, 33,643 points and overcoming too many injuries to count. But as Kobe Bryant embarks in his first year of retirement, it appears the Lakers’ star has become an expert at something else. He has done that with the launching of his own company, Kobe Inc. He released an animated short, Dear Basketball, that made its premiere at the Tribeca Film Festival this past weekend in New York City. And has shown in the video above, Bryant appeared on the “Jimmy Fallon Show” on Monday performing a poetry slam about Family Matters’ Steve Urkel. As the Lakers strive to extend their season past April for the first time in five years, newly hired general manager Rob Pelinka will listen to all trade proposals. That does not mean he will accept just any deal, though. Pelinka reiterated on an appearance on 710 ESPN’s “Mason and Ireland” on Monday that he likes the Lakers’ young core that features D’Angelo Russell, Brandon Ingram, Julius Randle, Jordan Clarkson, Larry Nance Jr. and Ivica Zubac. He also offered glowing reviews on Zubac after last year’s No. 32 pick out of Croatia emerged as the team’s starting center to close out the season. After once guiding the Showtime Lakers with five NBA championships through clutch shots and passes, Magic Johnson will try to help restore the franchise back to contention in another way. Johnson will serve as the Lakers’ representative on stage for the NBA draft lottery on May 16 in New York City. 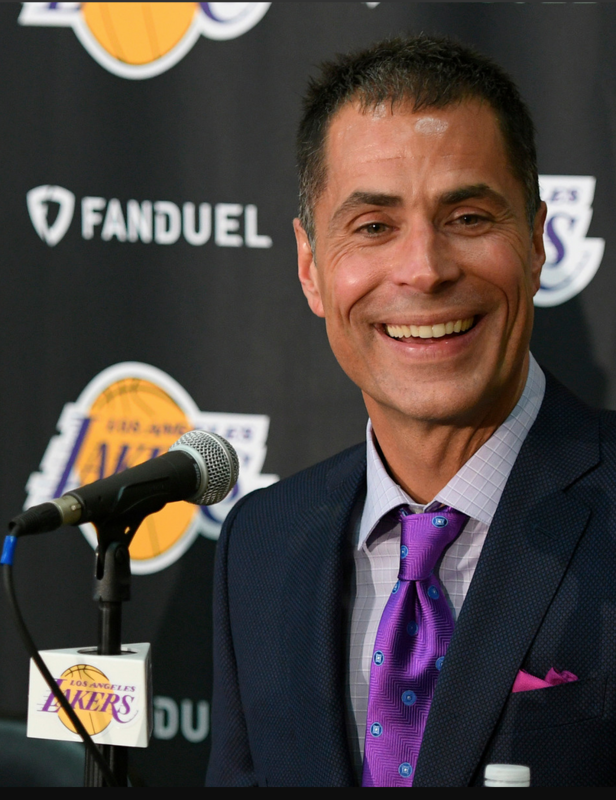 Meanwhile, Lakers general manager Rob Pelinka will be represent the Lakers in the drawing room. Then, the Lakers (26-56) will find out if their season that ended with a missed postseason appearance for the fourth consecutive year in a consolation prize. The Lakers must land a top-three pick, or else they will owe it to Philadelphia as part of the Steve Nash trade with Phoenix five years ago. The Lakers finished with the NBA’s third-worst record, giving them an 46.9 percent chance of their draft pick to stay within the top three. They also have an 15.6 percent chance at landing the No. 1 selection. Had the Lakers had the second-worst record, they would have had a 55.8 percent chance of keeping the pick and 19.9 percent odds of getting the No. 1 pick. Almost from the day he was born, Kobe Bryant became addicted to an round and leather ball. After cementing a storied 20-year NBA career that spanned five NBA championships and a third-place ranking on the league’s all-time scoring list, Bryant has. So with Bryant devoting an animated short explaining his love for that orange ball, does he miss holding it and shooting it? 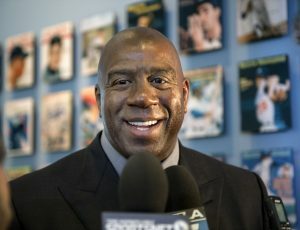 The disappointed look on Magic Johnson’s face may have shown his true feelings. So did the moment when Johnson snapped his fingers in frustration. As much as the Lakers are defined by winning, did he have conflicted feelings when they ended the season winning five of their last six games? After all, that gave the Lakers (26-56) the NBA’s third-worst record, a note that may hurt their NBA lottery chances on May 16. The Lakers have a 46.9 percent chance of keeping their-top three protected pick otherwise owed to Philadelphia as part of the Steve Nash deal five years ago. The Lakers also have a 15.6 percent chance of jumping up to No. 1. Had the Lakers finished with the NBA’s second-worst record, though, they would have had a 55.8 percent chance of keeping the pick and 19.9 percent odds of going No. 1. But Johnson then turned serious in between his chuckles. In order to win, the Lakers will also have to wrestle with another variable. To what extent do they retain their young core while pursuing to upgrade their roster? Johnson may have tipped his hand on Indiana forward Paul George. The Lakers will have to weigh the value between trading for him now at the expense of some young assets versus waiting to sign him next summer as a free agent without any assurances. Johnson cannot speak about other players specifically because of NBA tampering rules. But he all but confirmed George is a target, revealing how he might interact with him should they run into each other incidentally. “We’re going to say hi because we know each other. I just can’t say, ‘I want you to come to the Lakers’ even thought I’m be winking,” Johnson said, smiling. As he struggled excelling with a new role, a new system and teammates, Lakers forward Luol Deng understood the critical questions that it sparked. 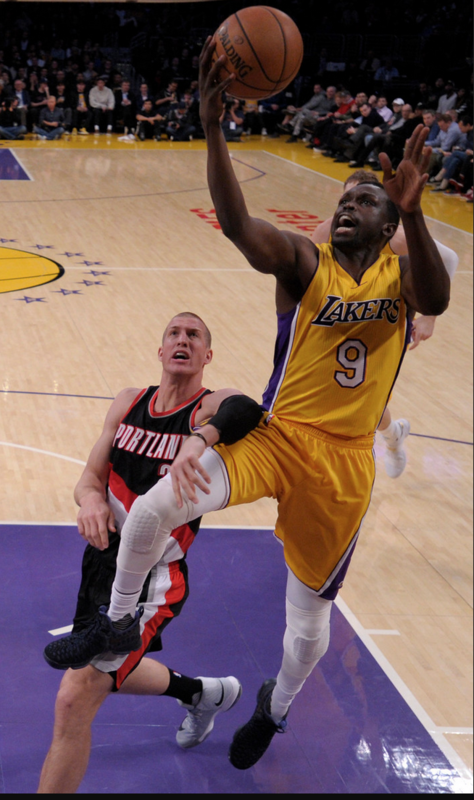 In his 12th NBA season, why did Deng post career-lows in points (7.6) and shooting percentage (38.7) in his first year with the Lakers? In what has become one of the most criticized free-agency moves last summer, why did the Lakers sign Deng to a four-year, $72 million deal? In what will be one of the Lakers’ most pressing offseason questions, will they find a way to deal Deng’s contract or can he find a way to provide more value on his return? Because of those issues, Deng sounded aware he faces an uncertain future. Deng basically received that message when he spoke with Lakers president of basketball operations Magic Johnson and general manager Rob Pelinka at his exit meeting. But since Deng is a player and not a GM, he offered his own message about his role should he remain with the Lakers. EL SEGUNDO — The premise sounded absurd to Lakers guard David Nwaba, the idea that his life story through his first 24 years would provide enough interesting material for a movie. Nwaba starred at University High of Los Angeles. But he received no scholarship offers. He transferred from Hawaii Pacific to Santa Monica College to Cal Poly-San Luis Obispo, and led the Mustangs to their first ever NCAA tournament. But Nwaba went undrafted. He joined the Lakers’ Development League affiliate, the D-Fenders, wondering if he would ever fulfill his dream in playing in the NBA. But less than a season later, Nwaba’s dream came true by playing for his hometown team after growing up idolizing Kobe Bryant. Still, Nwaba contended “the story doesn’t seem too special” to warrant a script distributed in Hollywood. But he obviously considers the journey traveled to be special. After all, Nwaba believes he is “ahead of schedule” in his hope to crack an NBA roster. 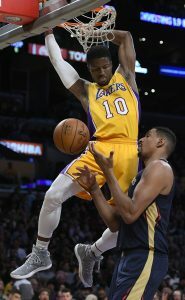 The Lakers called Nwaba up for a 10-day contract shortly after negotiating a buyout for veteran guard Jose Calderon following the Feb. 23 trade deadline. With the Lakers bound for a failed postseason stint for the fourth consecutive season, they wanted to evaluate a young, emerging player. With the Lakers eventually ranking nearly last in every defensive category, the Lakers wanted a player that could improve those numbers. The Lakers saw enough to offer Nwaba a second 10-day contract. They also saw enough to sign Nwaba for the remainder of the 2016-17 season and a team option for next season. During that time, Nwaba averaged 6.0 points on 58 percent shooting and 3.2 rebounds in 19.9 minutes through 20 appearances and two starts.